Are you searching for the most beautiful 2018 Our New Home Christmas ornaments? With Christmas around the corner, you just like anyone else is prepping yourself to decorate the Christmas tree, house, boxes or send gift items. However, with so many new items on offer, you may be finding it a bit challenging. The good news, though is that we have compiled the top New Home Christmas ornaments in 2018 and they include the following ones. 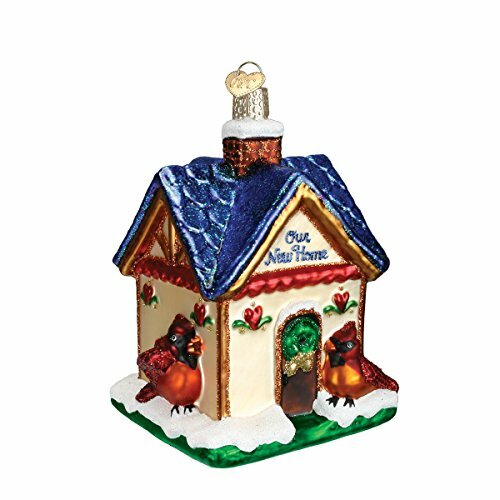 Make your Christmas tree glittery by investing in the New Home ornament by Old World Christmas. Made from mouth-blown glass, this ornament is very unique and brings out a classic 1800s appeal. It features finely curved molds and shiny surface that will spark with every glimmer of light. The hand- crafted and hand-painted ornament is also ideal as a gift or collector’s item. 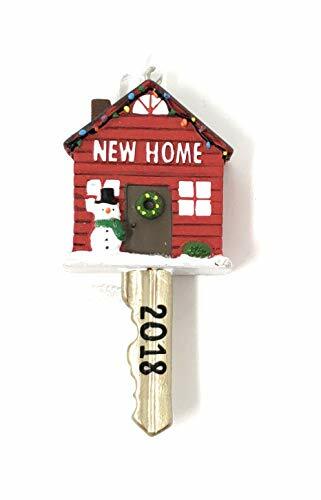 This beautifully crafted Our New Home key ornament is perfect for those who feel the nostalgia of the Christmas celebrations from the past. The sweet piece can be used to adorn the Christmas tree, placed with other gifts, added to the collection or gifted as a “first Christmas in our new home” to a loved one. The elegantly designed and decorated key measures 4.1 inches. The Lenox brand is well-known and respected for providing some of the best Christmas ornaments. This time round they are offering the “2018 Our First Year” piece that is ideal for hanging or placing on trees, walls, door or other surfaces. It’s made from high-quality fine china and measures 10 (L) x 5(W) x 3(H) inches while its weight is 4.8 ounces. 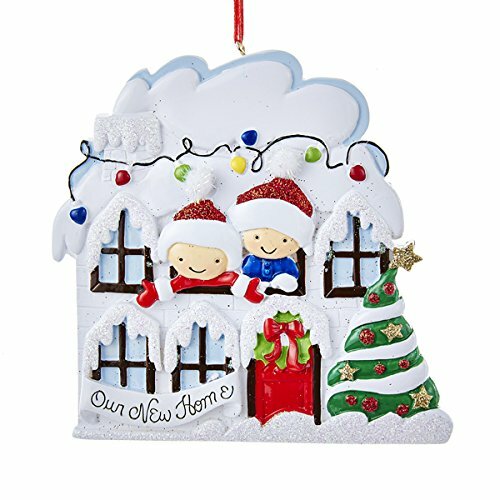 Create lasting and beautiful memories with this 3″x 1 5/8″ Hallmark New Home ornament 2018 for the tree. 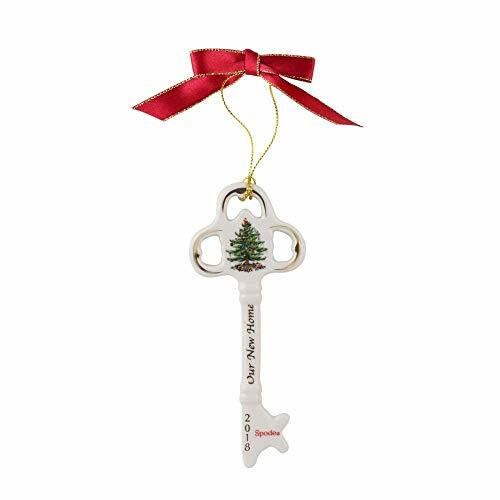 The charming ornament brings out the Christmas mood with its all-in-one home and key design. As you can see the look is quite traditional and allows to bring in memories from the past even though you’re in a new house. It comes prepackaged for easy use, storage and preservation. Fifth on our 2018 Our New Home Christmas ornaments list is the Christmas home ornament by Kurt Adler. It’s made out of high-grade resin material and is about 5 inches in height. Designed for hanging on trees, placing on walls, gift item or collector’s item, the ornament can be easily be personalized by hand. In addition to enhancing the elegance around, this piece is made to last for a long time. You don’t have to buy cheap-looking or low-quality Christmas tree decorations. You also shouldn’t buy an item that isn’t trendy or right for Christmas. Simply follow the above guide and discover the top ornaments in the market. And if you’re not seduced by those featured above, you might find the one you’re looking for over at Ornamentshop. Here are a few of the myriad of options to choose from. Also, did you know that you can acquire lots of other items from Amazon right from here? Make your Christmas jolly, colorful and memorable by investing in any of the items listed in First Christmas in Our New Home tree ornaments. Tagged 2018 new home ornament, 2018 our new home christmas ornaments, christmas in our new home ornament, christmas tree ornaments, hallmark tree ornaments, kurt adler tree ornaments, lenox tree ornaments, new home christmas tree ornament, new home tree ornament, old world christmas tree ornaments, our new home christmas ornament, our new home ornament, Personalized first Christmas in our new home ornament, porcelain tree ornaments, resin tree ornament, spode christmas tree ornaments.